Miltoncontact: Think Global for your IP (intellectual Property) Strategy! Think Global for your IP (intellectual Property) Strategy! This was the tenet running through an excellent presentation at the St John’s Innovation Centre, by Zeev Fisher (FreshIP, Cambridge) and supported by Cliff Hyra (Symbus Law Group, USA). A key point to reiterate before the rest of the article: If you think you have an idea worth protecting DO NOT TALK ABOUT IT OPENLY TO OTHERS. Ensure that when you do discuss the ideas, you have a non-disclosure agreement in place. Otherwise all your later efforts will be for nought! Get an IP/Patent Expert involved as soon as possible. IP (Intellectual Property) is the core element of any innovative company and yet strangely undervalued or overlooked in the UK. The US experience is that typically, a granted patent has an average value of $300,000 and can form up to 75% of the company’s market value. Not only can IP become a revenue stream, it can support lending. The processes of patent applications have moved on in the decade since I was involved in them as part of a research company. Whilst it is still important to determine where in the world your existing and potential markets are, patent offices are beginning to communicate more effectively. 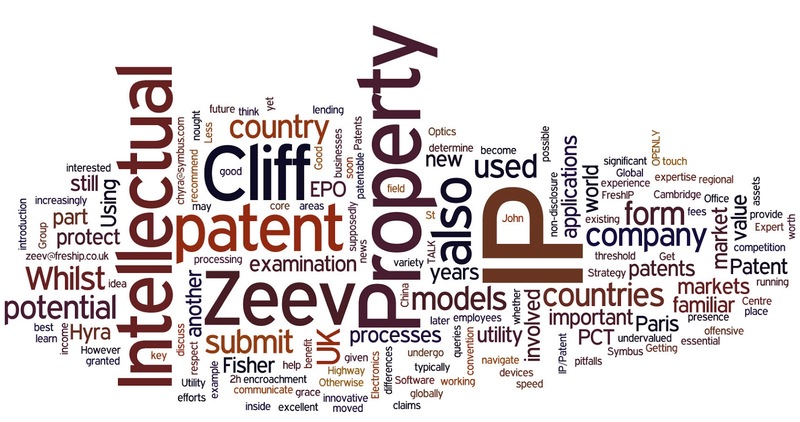 For example, there is now the Patent Prosecution Highway (PPH) to speed up patent processes for further countries - if your claims have been found patentable in one country. Patents are also covered by a variety of conventions, such as the Paris Convention and PCT. It is important to know whether your target markets are inside these or not as this can also impact on applications. This can work to your benefit as follows: If you submit a patent application to the European Patent Office (EPO), you have a years grace to submit in another country outside of the EPO if it is under the Paris convention. If the new countries are also part of the PCT, then you may also have an additional 1.5 years within which to apply. However, in this supposedly increasingly globalised world, the examination of your patent will still undergo examination and processing specific to each country or at best, regional block. The differences and experiences can be significant. Getting expert help to navigate the potential pitfalls is essential. Good news for micro-businesses though (Less than 500 employees and $150,000 income). If you are below this threshold, you can submit 4 patents with a 75% reduction in fees in the US! We also had a good introduction on the potential uses of IP for defensive and offensive purposes. Using IP to protect your assets is the process we are most familiar with. Using IP more proactively to secure a market presence and protect against future encroachment of the competition into your areas included some novel strategies that I had not considered before. Whilst patents and trademarks are familiar to most businesses, I was interested to learn of another form of IP used in other countries, “utility models”. Utility models provide protection for functional designs – relevant in manufacturing. Whilst not used in the UK, utility models are used in Germany and very extensively in China as a form of IP. At the end of the 2h Seminar, Zeev and Cliff had given me new insights into applying IP globally – and a healthy respect for their expertise. If you are working in the field of Medical devices, Electronics, Optics, Software and Cleantech and have IP queries, I recommend getting in touch with Zeev Fisher in the UK at zeev@freship.co.uk and Clifford D. Hyra in the US at chyra@symbus.com.